Chateau Clinet has released at £864 per case of 12, a 20% euro increase on last year, translating as a 38% sterling increase. However, with a stunning score of 96-98 points and therefore one of the Right Bank wines of the vintage, Clinet 2016 stands up to its price increase. The 95-97 point scoring 2015 has increased 44% in value since its release and now trades at £900. The 96+ point scoring 2010 trades at a 22% premium, the 96 point scoring 2005 a 27% increase. Martin pronounces ‘Yes, this is a magnificent Clinet, cool and mineral-soaked, both cerebral and lip-smackingly delicious.’ This is a truly exceptional Clinet which leaves collectors with plenty of upside price potential, it is also one of the finest Clinets ever and well priced for Pomerol of this stellar quality in a truly great vintage. The 2016 release of Clinet shows an attractive discount to the projected release price for a vintage with a median score of 97. 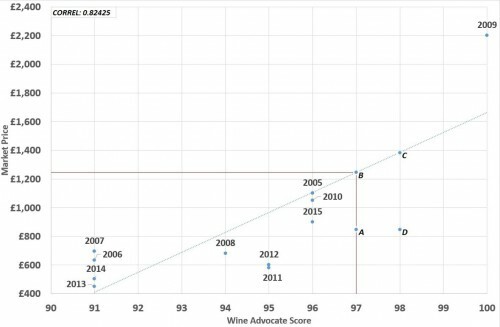 A comparison of the current market price and scores from The Wine Advocate of the past 11 vintages would indicate the 2016 releases natural price be around £1,250 (point B on the graph). Therefore, today’s release price of £864 (point A on the graph) presents an opportunity with the potential for near term appreciation. As the price of the 2016 adjusts to its natural point, an upward shift from point A to B can be expected, with the entire distance between the two points equating to potential profit (approximately £390). Should the 2016 achieve 98 points upon rescore, the upper end of its banded score, this adjustment will increase further. The release price will remain unchanged, causing a parallel shift from point A to D, whereas the projected value will move upward, along the trendline, from point B to C. The distance between points D and C, approximately £520, therefore becomes potential returns. We view Clinet as a strong buy! Clinet is now simply one of the best estates in Bordeaux. It is a small property with only 11.27 hectares located on the highest point of the Pomerol plateau, close to L’Eglise Clinet and Trotanoy. The property’s 45 year old vines rest in soils that are a wonderful balance of gravel, clay and rich sand, planted with 85% Merlot, 10% Cabernet Franc and 5% Cabernet Sauvignon. Clinet only produces 3,200 cases a year and the wine is incredibly rich, exquisitely balanced, with a powerful but delicate texture and a finish that goes on for minutes at a time.